Can someone please help the North Korean government out? The propaganda ministers stink at Photoshop. Please get them to sign up for a class at their local community college. Or maybe Dennis Rodman can help. As frightening as North Korea can seem, honestly, the country's inability to master the art of Photoshop should leave doubts about their ability to do a lot of things, such as making proper spreadsheets and resize GIFs—not to mention feed its people. 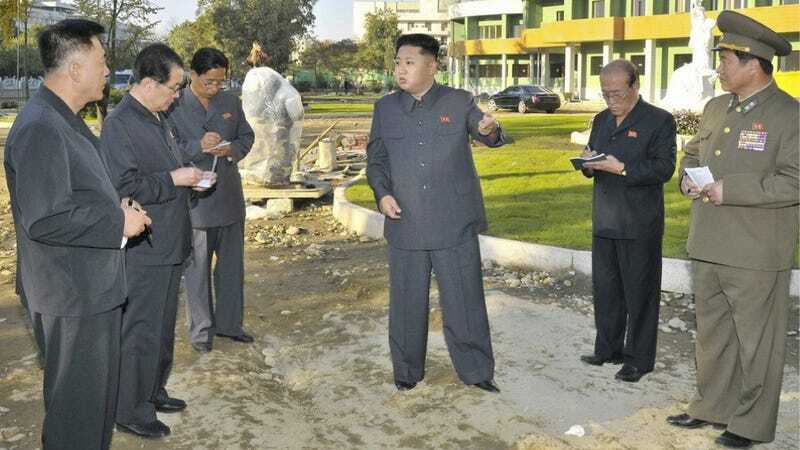 The above image was released by the country's state media (via Chinese site NetEase) and "shows" Kim Jong-un at a new children's hospital that's under construction in Pyongyang. But did you look at the shadows and the lighting? The figures appear to be superimposed—something that internet commenters in China were quick to notice. Below, you can see closer details of fuzziness around the legs and floaty feet as well as odd shadows around the hands. Kim Jong-un's hand shadow in particular looks too clean and defined. Online in neighboring Japan, amused internet commenters showed how easy it was to add individuals to this scene. Whoever did this should get a job working for the North Korean government! Or, at the very least, show them how to up their game. In case you missed it, here's a brief history of North Korean Photoshops. Update: Check out the photo forensics (via Kotaku reader Robish.W) for the above image. There is Photoshop "rainbowing", among other oddities like what looks to be layering. All this seems to show that pic was indeed faked or altered.